Going Native or Going Naive? is a critical analysis of an esoteric-Indian movement, called white shamanism. This movement, originating from the 1980's New Age boom, redefines the phenomenon of playing Indian. For white shamans and their followers, Indianness turns into a signifier for cultural cloning. By generating a neo-primitivistic bias, white shamanism utilizes esoteric reconceptualizations of ethnicity and identity. In Going Native or Going Naive?, a retrospective view on psychohistorical and sociopolitical implications of Indianness and (ig)noble savage metaphors should clarify the prefix neo within postmodern adaptations of primitivism. The appropriation of an Indian simulacrum by white shamans as well as white shamanic disciplines connotes a subtle, yet hazardous form of ethnocentrism. Transcending mere market trends and profit margins, white shamanism epitomizes synthetic/cybernetic acculturations. 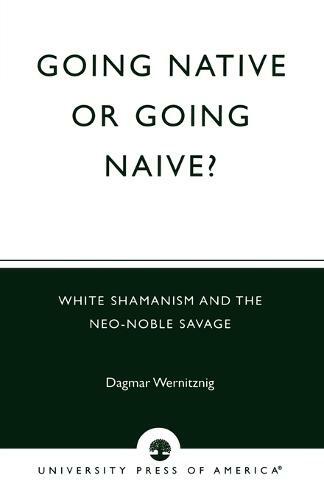 Through investigating the white shamanic matrix, Going Native or Going Naive? is intended to make these synthesizing processes more transparent.